June 4th, 2013 – Colchester UK. Concurrent Technologies announces their first processor board based on the quad-core 4th generation Intel® Core™ processor family (previously codenamed “Haswell”). The TR B12/msd is a 3U VPX board featuring the Intel® Core™ i7-4700EQ processor and the associated mobile Intel® QM87 Express chipset. With up to 16 Gbytes of DRAM and a rich assortment of I/O interfaces, this board is an ideal processor board for 3U VPX solutions requiring the latest in processing performance. 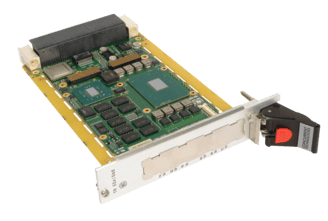 3U VPX is particularly well suited to high-end compute intensive applications in military embedded, aerospace and transportation systems for data acquisition, control systems and video signal processing. The 4th generation Intel® Core™ processor family is based on 22nm process technology. This quad-core processor provides enhanced CPU and graphics performance over previous generations at TDP levels up to 47W. Additionally, new instructions are introduced, including: the Intel® Advanced Vector Extensions 2.0 (Intel® AVX) to provide a performance improvement in integer and floating-point-intensive computations particularly appropriate for image processing applications, and the Intel® AES New Instructions (Intel® AES-NI) enhancements to accelerate data encryption and decryption in hardware. The TR B12/msd is a 3U VPX processor board featuring this latest quad-core processor and supporting chipset, with up to 16Gbytes DDR3L DRAM with ECC. Additional features include 4 x SATA600 mass storage interfaces, on-board SATA Flash, serial and USB interfaces, graphics and stereo audio interfaces. The wide range of I/O interfaces can be further expanded by the addition of an XMC module.The board supports a configurable control plane fabric interface (VITA 46.6) and a flexible PCI Express® (PCIe) data plane fabric interface (VITA 46.4) supporting up to Gen 3 data rates and can be used in systems defined by OpenVPX (VITA 65). Optional features include Built in Test (BIT) and a board level security package which provides a means to enhance the security of equipment to prevent access to sensitive data and key Intellectual Property. The TR B1x/msd can be integrated into systems together with Concurrent Technologies’ switches and mass storage boards. To ease integration, many of today’s leading embedded operating systems including Windows®, Linux® and VxWorks® are supported. Systems using multiple processing boards will benefit from the optional Fabric Interconnect Networking Software (FIN-S) which provides a high performance, low latency, communications mechanism for multiple host boards to intercommunicate across the high-speed fabric interface. The TR B1x/msd processor board is released as a commercial air-cooled board, while later releases will include dual-core processor options and ruggedized variants.